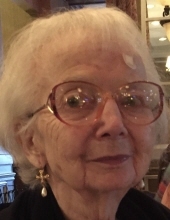 Alice M. Remcheck, age 92, of Presbyterian SeniorCare of Washington, PA, formerly of the Lincoln Place neighborhood of Pittsburgh, passed away peacefully on April 13, 2019. She is survived by her sons, Mark (Diana) Remcheck and Frank (Susan) Remcheck; grandchildren, Kristen (Tim) Lynch and Jim Remcheck, and Allison (Andrew) Pernetti and Jessica Remcheck; great-grandchildren, Alexander and Benjamin Lynch, and Cecily Pernetti; as well as cousins, nieces, nephews, and friends. She was preceded in death by her beloved husband, Frank P. Remcheck, Sr.; parents, Andrew and Alice Schubert; and siblings, infant Marcel, Andrew, Margaret, Olga "Cookie," Albert, Marcel, and George. Alice worked out of Union Local 57 Hospitality Workers at many major hotels in downtown Pittsburgh. She also worked at the Allegheny Club at 3 Rivers Stadium and the Duquesne Club for many years. She loved flower gardening and dancing, but her true passion was loving and enjoying her family. Visitation will be held on Wednesday, April 17, 4:00 pm - 8:00 pm at the JEFFERSON MEMORIAL FUNERAL HOME, INC., 301 Curry Hollow Rd., Pleasant Hills, 15236. A Blessing Service will be held on Thursday, April 18, 12 noon, in the funeral home chapel. Memorial contributions may be made to Presbyterian SeniorCare (www.srcare.org/give-now). Condolences may be left at www.jeffersonmemorial.biz. To send flowers or a remembrance gift to the family of Alice M. Remcheck (Schubert), please visit our Tribute Store. "Email Address" would like to share the life celebration of Alice M. Remcheck (Schubert). Click on the "link" to go to share a favorite memory or leave a condolence message for the family.